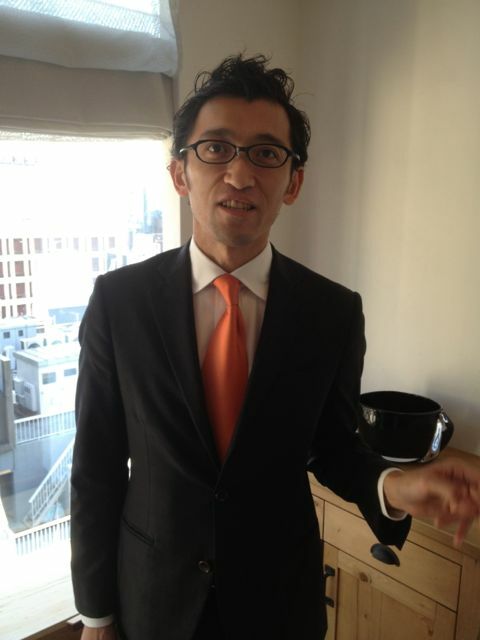 Joseph Mallozzi's Weblog: November 9, 2012: Last full day in Tokyo! 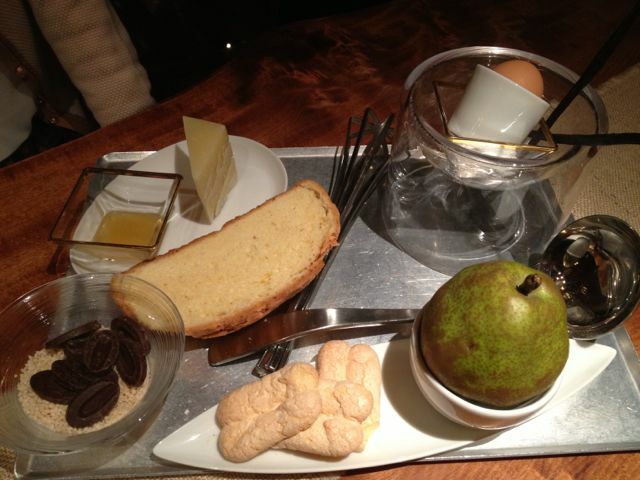 Restaurant Esquisse! Chez Tomo! November 9, 2012: Last full day in Tokyo! 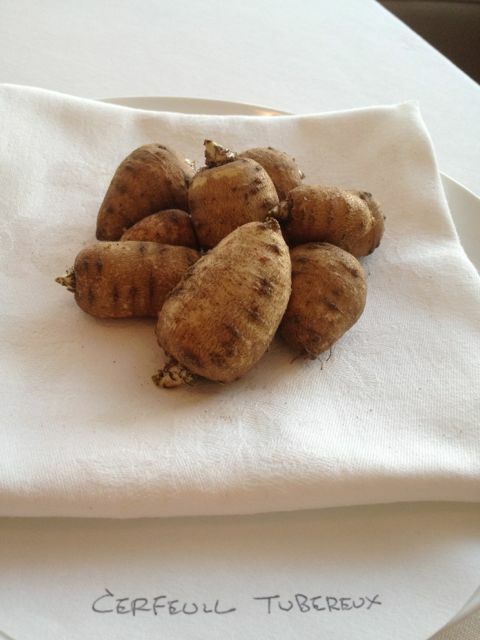 Restaurant Esquisse! Chez Tomo! 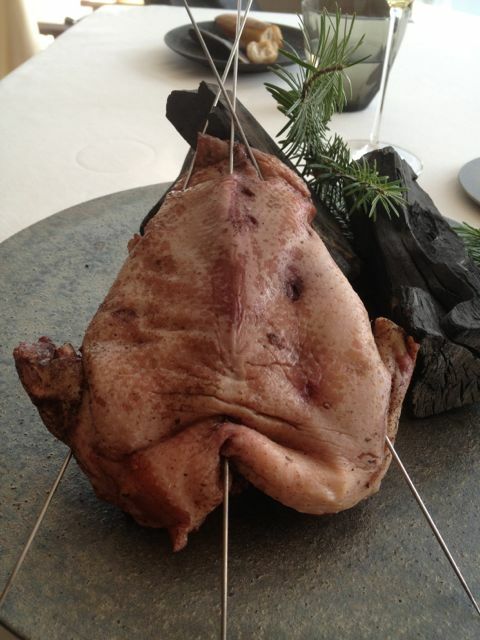 My friend Moro-san suggested we go to lunch at Restaurant Esquisse, a relatively new addition to the Ginza dining scene. It has only been open for about four months now and yet, in that short time, garnered some great word of mouth. Always up to trying something new, I booked us a table. I arrived early and had just taken a seat at the table when I was greeted by a familiar smile. It was none other than Chef Lionel Beccat, the culinary magician who had crafted one of the most memorable meals I’ve ever had the pleasure to sit down to in Tokyo – which also happened to be my very first date with Akemi (all the details in pictures here: November 30, 2009: Tokyo Travel Day $6 – Ginza La Tour, Michel Troisgros). 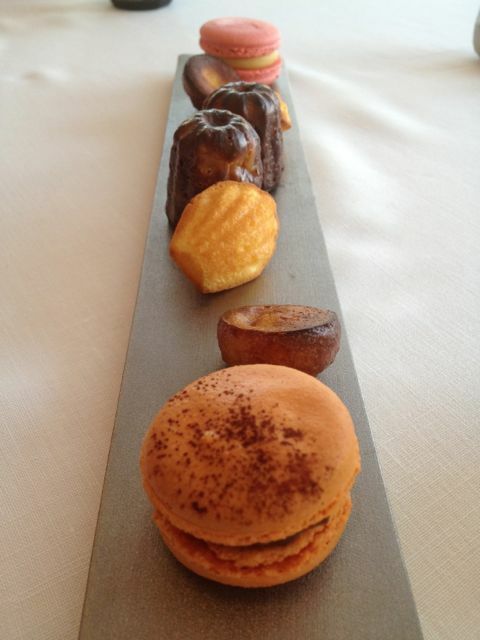 Back then he was at Cuisine Michel Troisgros. 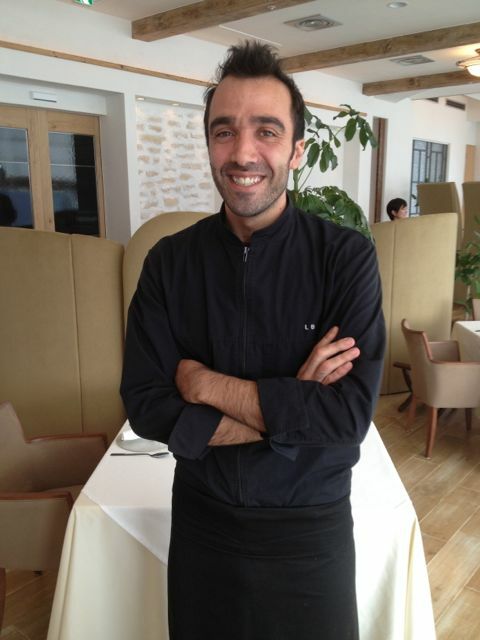 Today, he heads the kitchen at Restaurant Esquisse and, judging by the meal we enjoyed, he is still firing on all creative cylinders. Apple soufflé. Incredibly delicate, airy, but with a lovely pronounced apple bite. 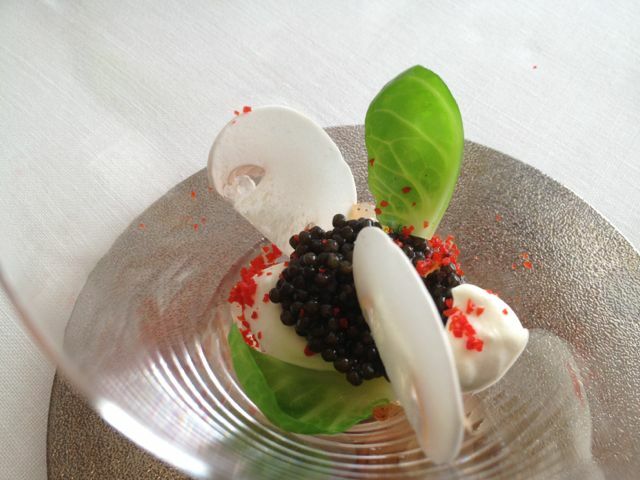 Lobster with caviar, mushrooms, lobster brain and mustard cream. 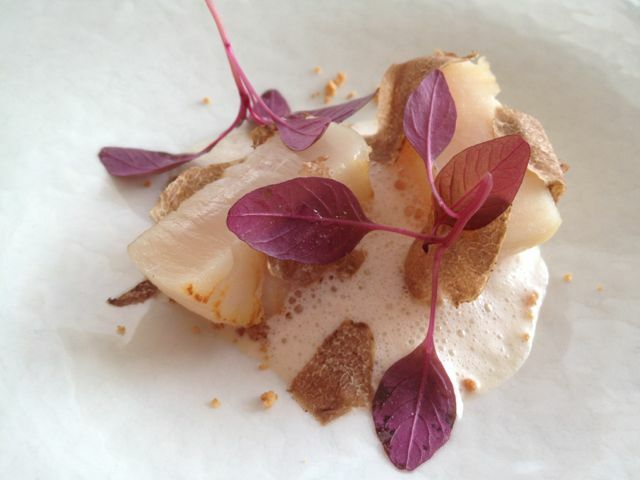 Like all Chef Beccat’s dishes, it balances delicacy with complexity of flavors. 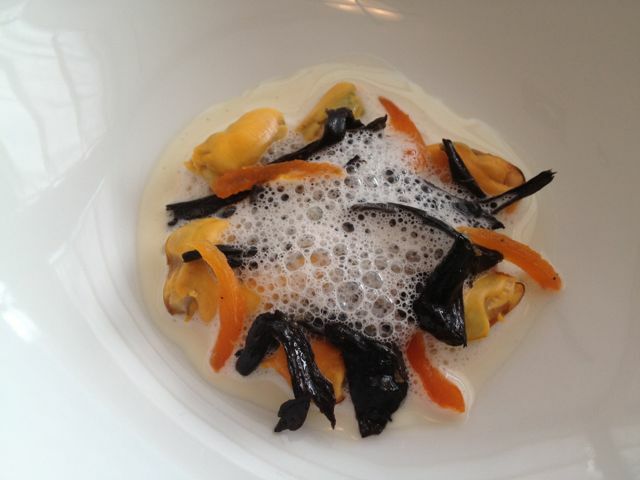 Mussels with trumpet mushrooms, apricot, and lemongrass foam. 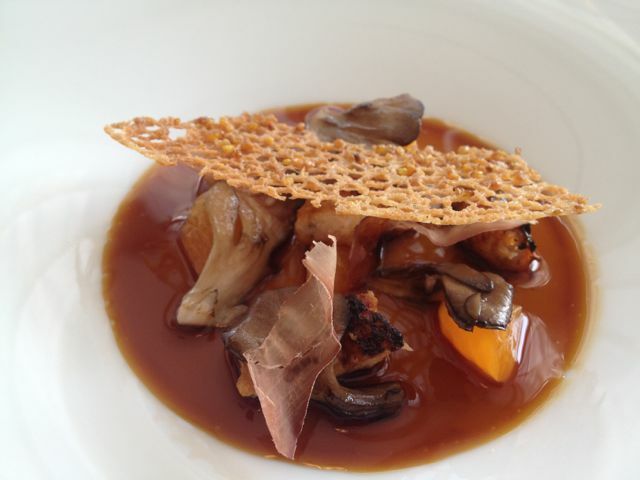 Foie gras with grilled anago, mandarin orange, and maitake mushrooms. Loved the creme brûlée preparation of the foie. Scallops with truffles and almond-hazelnut foam.I know some aren’t fans of foams but when done right (like in this dish) they had a whole other level of scent and flavor. 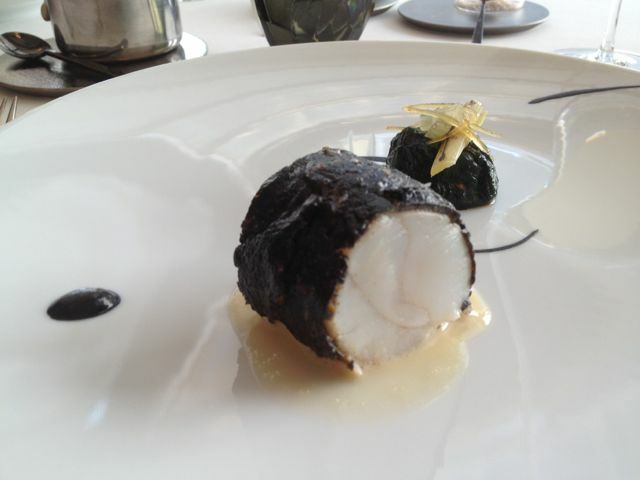 Monkfish prepped in konbu, then yogurt, wrapped in black olive and sepia accompanied by its spinach-wrapped liver with raisins. A stronger, meatier fish that marries well to the black olive and squid ink. Japanese oysters with apple and daikon horseradish emulsion topped with lemon caviar. 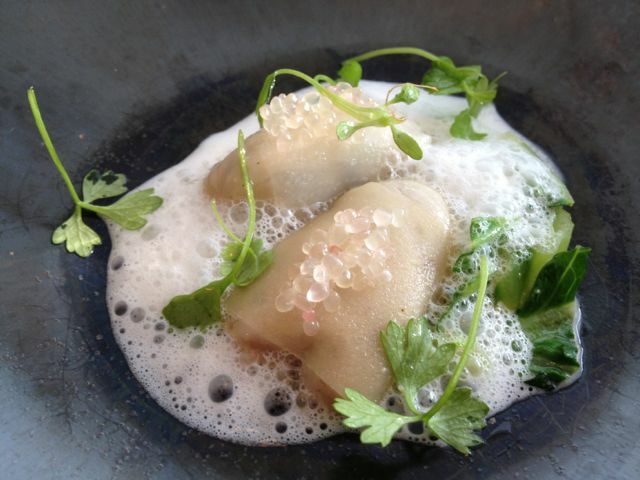 A refreshing palate cleanser to break up the robust flavors of the bracketing dishes. 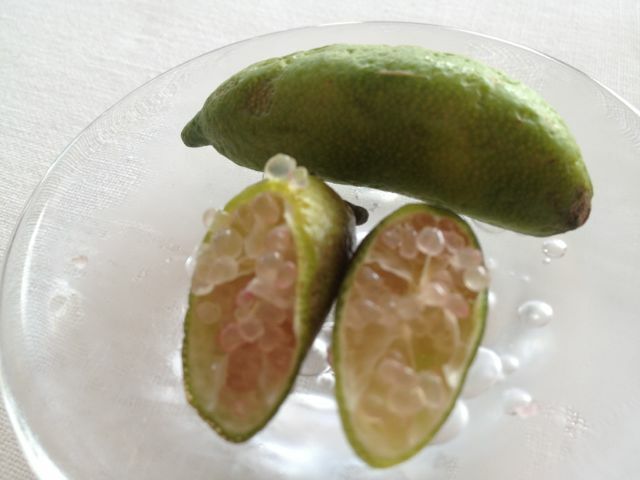 The lemon caviar in its natural state. They go for about $10 a pop. 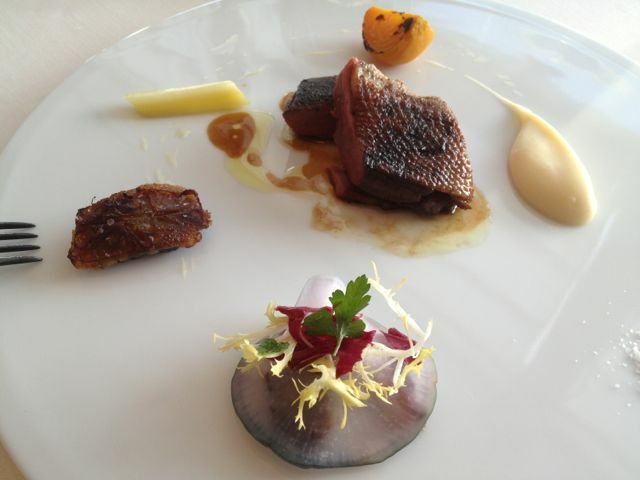 Wild duck with a (not) celeriac puree, beet, white carrot, red radish, and Cyprus salt – accompanied by its date-covered leg. Duck is tricky. Undercooked, it’s chewy. Overcooked, it’s inedible. Here, the preparation is perfect, crispy-skinned and tender. I say the duck was served with (not) celeriac puree above because, although that’s what I assumed it was, our helpful waiter explained it was actually cerfeuil. And, when I expressed confusion, he popped back into the kitchen and returned with a sample. Chervil! Really? Sorry. By the time I finished it, I realized I’d forgotten to snap a pic. I toyed with the idea of hanging around and getting a photo of our neighbor’s plate but ultimately decided to go with this. What you missed: Grape sorbet from Kyojo with whipped grape champagne creme brulee and a confit Porto, topped with an anise treat. Tarte tain with vanilla ice cream, creme anglaise, roast pear, rusk, and sugar caramel. Another triumph of taste, temperature and textural contrasts – sweet, salty, sour, warm, cold, crispy, crunchy, soft, and chewy. Our guide on this culinary odyssey: Chiba Tadashi who painstakingly explained every dish and, whenever I expressed confusion, ducked back into the kitchen to retrieve the ingredients to hopefully help clarify. A wonderful lunch. Much thanks to Chiba-san for going above and beyond the call to make our lunch as informative as possible (even though, I’m sure, I’ve missed plenty of the details in attempting to jot them down, shorthand, on my iphone notepad). And, of course, many thanks to Chef Beccat for yet another memorable meal. I’ll definitely be back on my return visit to Tokyo. If there are two things I’ve eaten A LOT of on this trip, it’s foie gras and sea urchin. And that’s been perfectly fine by me. 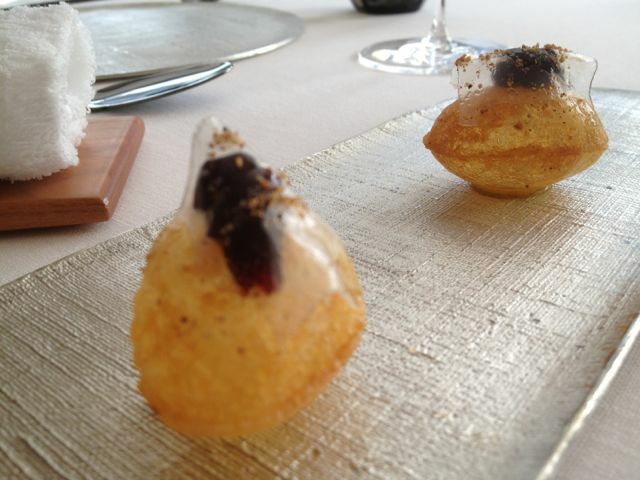 In this dish, the sea urchin is served with lobster in a bisque-like preparation served in the uni’s shell. Interesting. Flounder-wrapped around Japanese pear accompanied by a Japanese pear ravioli, beets, seawater gelatin cubes, and black olive tapenade. Quite a few acidic notes. 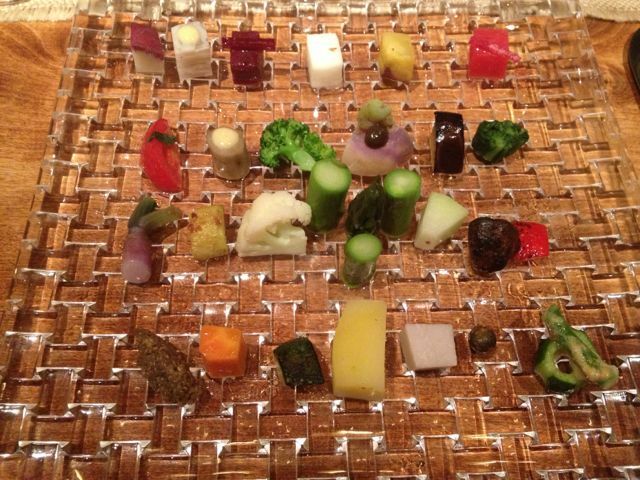 A mosaic of between 28-30 organic vegetables from Yamanashi. 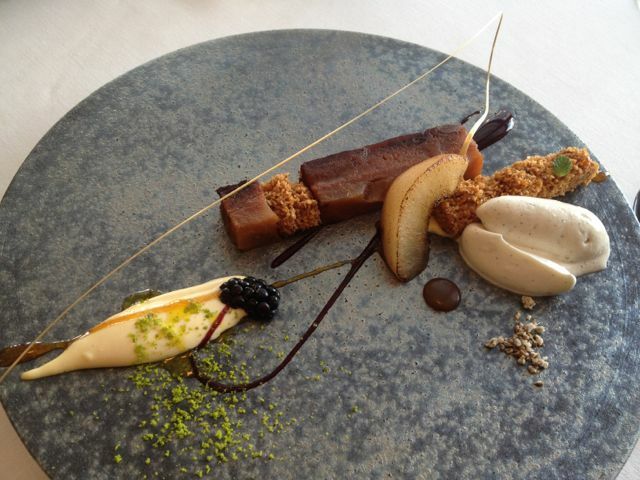 This dish was a blast to eat, offering up an incredible variety of tastes and textures. 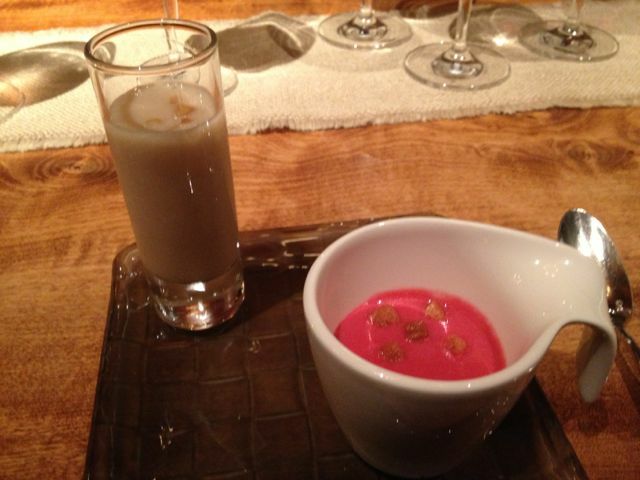 A soup duo: chilled chestnut on the left and a warm beet-laced vegetable medley on the right. 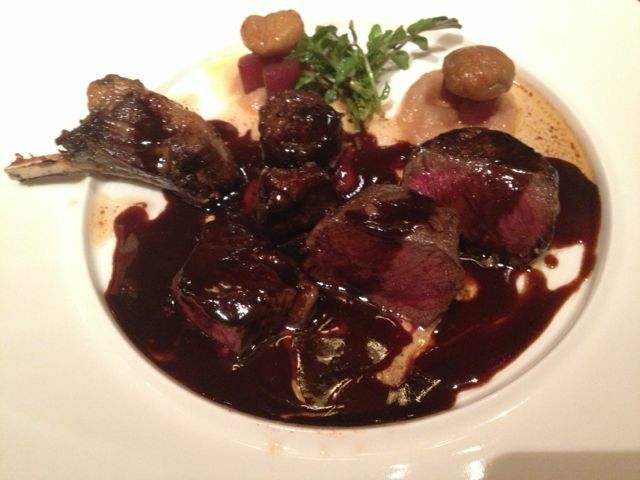 Roasted Hokkaido wild Yezo deer roast, patty and heart sauté, served with black pepper sauce. 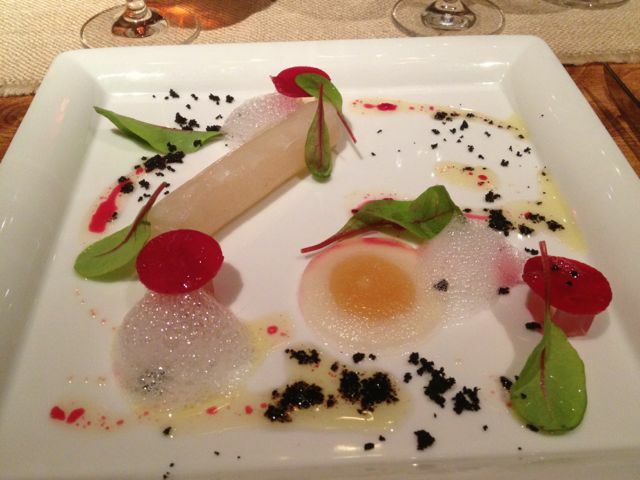 The presentation left a little something to be desired but the dish was delicious nevertheless. Surprisingly sweet and lacking in black pepper kick given the black pepper in the description. The chocolate trio. 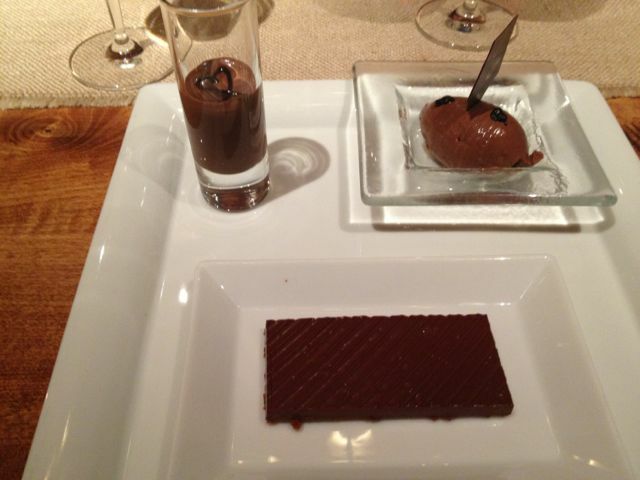 A so-so cold chocolate drink accompanied by a delightfully dense chocolate ganache and bittersweet chocolate ice cream. Homeward-bound today and Akemi and I are really looking forward to seeing the dogs. See you in Van and thanks for tagging along! Previous Article November 9, 2012: Tokyo Day….? I’ve lost count! Star Bar! Nodaiwa! Nakajima! Quintessence! Next Article November 10, 2012: Sayanora Tokyo! Dai San Harumi! 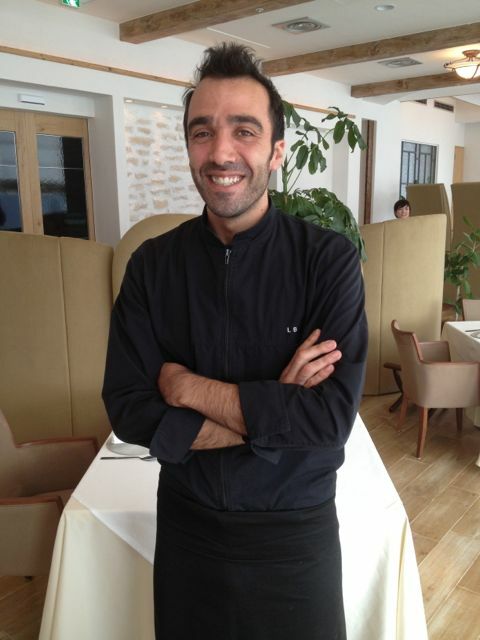 I totally thought Chef Lionel was Lawren, come to meet you in Japan. It’s hard to choose my favorite of this trip’s food descriptions. It is clear from your photographs that many of the dishes not only sound wonderful, but look incredible – almost like works of art. Thanks as always for sharing. Look forward to hearing how the dogs fared in your absence. Know they will be glad to see you and Akemi. Thanks for all the great pictures! Safe travels, Joe and Akemi. 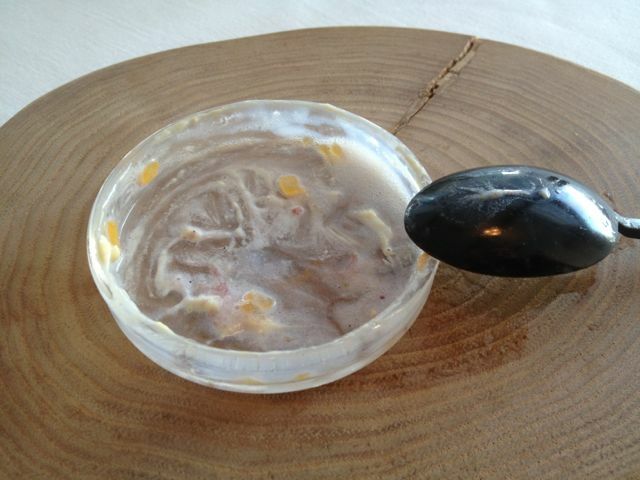 …..lobster brain….. after I saw that, I just could not absorb any more. The pictures look terrific, but ….lobster brains? A whole new level of different, even if it was only a single component to a larger dish. Thank you for sharing,and safe flight home. Just like all the meals you’ve had this one looked amazing. It was our pleasure to tag along, I can assure you. I hope you guys have a good trip back and we’ll see you on the flipside! 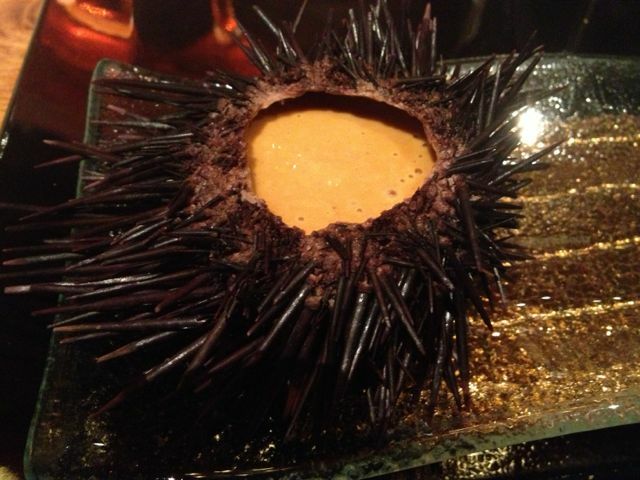 I have always wanted to try sea urchin. First time I saw it was on Iron Chef America. I believe Bobby Flay was preparing it. It looked so delicious! It must be a rare delicacy. I also can imagine it must very expensive. I dunno how I can get my hand on some seas urchin without emptying my bank account. Let us know if you are up for a mail bag concerning your trip. Is it groundhog day? Are you home repeating Saturday again? Wow, I’ve enjoyed all the trip descriptions, the food photos and videos these days, in lurker-mode. Glad you are both returning home, stuffed to the brim and anxious to reunite with the fuzzy pawsome. Safe journeys! Now, on another note. My 17 yr old refrigerator is about to give out. I’m considering a different style as replacement. What does this blog’s community think about a bottom freezer style with single top door? Pros, cons? Have enjoyed everything — *Weird Ice Cream Videos! * photos, stories, Akemi’s family, friends, SUSHI , and especially the sights & culture of Japan outside of Tokyo. It was so different, fun-loving, and boisterous-sounding. Joe, your family seems pretty laid back. Has part of your Italian family ever been like Osaka? Hope you had a safe trip home! Did you get plastered in puppy kisses? Thank you for sharing your Tokyo trip with us. Quite funny that you met Chiba Tadashi (he was even wearing the same tie as in the November 30, 2009 entry) and Chef Lionel Beccat together again, it’s a small world after all.